Mud is a movie I don't get, and I don't think the problem is necessarily with me. It's written and directed by Jeff Nichols, who directed Shotgun Stories and Take Shelter, two films that were adored by pretty much everyone but me. (I enjoyed much of Take Shelter but felt Nichols had lost control of his tone by the time Michael Shannon gets into fistfights at the fish fry.) And I liked both of those movies more than Mud. Nichols is a master of atmosphere who can conjure up the old Southern gothic, and I have no doubt he has lots on his mind. But I have a hard time following him everywhere he wants me to go. 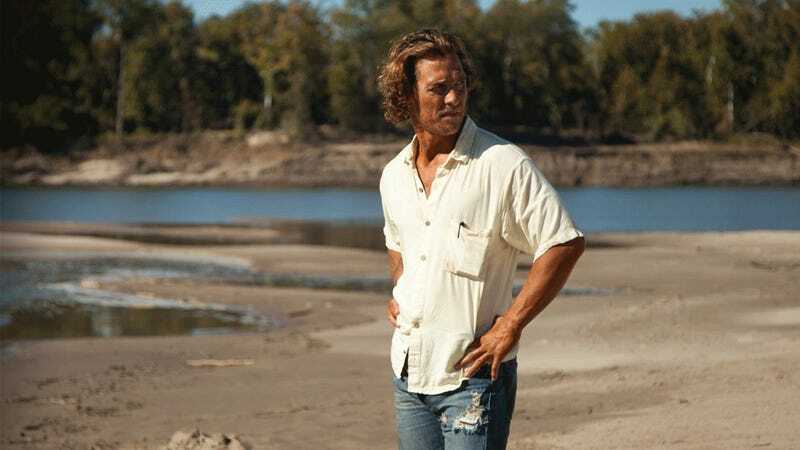 The "Mud" of the title is in fact a grizzled, scrawny Arkansas drifter/fugitive played by Matthew McConaughey in another impressive performance in a movie I can't go all the way with. (Now that McConaughey has decided he doesn't care about being a huge movie star anymore, he's becoming better—and bigger—than he ever was before.) Mud is on the run after shooting a man for beating up his longtime love Juniper (Reese Witherspoon), whom he called "a dream you don't wanna wake up from." Mud talks like this a lot, through rotted teeth and odd optimism about love and the universe. He ends up stranded on an island, where two boys, Ellis and Neckbone (though Nichols probably should have stopped kidding himself and just called them "Tom" and "Huck") discover him and end up helping him escape and save Juniper. Along the way, of course, they meet all sorts of unsavory characters, like the sniper who lives across the water (Sam Shepard), the evil Arkansas mob-lord father of the man Mud killed (Joe Don Baker, an actor I was ecstatic to learn was still alive) and Juniper herself, who turns out not necessarily to be worth all the trouble Mud goes through for her. Ellis and Neckbone travel the muddy Arkansas terrain, rambling from one adventure to another, trying to figure out love and women and what it all means. Technically speaking, Ellis and Neckbone get themselves into some hairy situations, but as Nichols shows it, they never seem in any real danger. There's a weird fantasyland aspect to the whole film, like it's an old memory only hazily recalled. And for a while it works: The movie drifts into pleasant metaphorical fog so easily you don't mind when the story starts to wander all over the place. But then Nichols clicks back into the actual plot, and its resolution, and all these characters—who seem more like representations of people than actual people—suddenly all have to move themselves into position to wrap things up, and next thing you know, there's a big climactic shootout scene. I might not have been crazy about Take Shelter, but at least Nichols kept a firm hand on the till in that movie; here, he keeps floating aimlessly down the same river that's at the middle of the movie. Are we supposed to take all this seriously, with the boats and the talk of love curin' all, y'all, the coming-of-age story morphing with a weird Ozark romance shoot 'em' up? Oh, and about the romance. I humbly submit that Mud perhaps has a bit of a lady problem? There are only three women in the film. There's Juniper, who does nothing but betray Mud throughout the whole movie and seems to enjoy men being beaten and killed over her hand. There is Ellis' mother, who has a couple moments of quiet dignity but mostly seems to be browbeating her quiet but noble and hard-working husband. And there is the girl Ellis has a crush on, an older girl who appears sweet and gives him his first kiss but is necking with a senior and not giving two shits about Ellis, with no explanation, only a couple of scenes later. I understand that a lot of this movie is through the perspective of a 14-year-old boy, so we're not exactly going to get a Hélène Cixous dissertation or anything, but it's also ostensibly a film about love and what it means to give yourself up for someone. And all the women in this movie are shrews, liars and/or emasculators. There's a lot to like in Mud, from the warm, inviting atmosphere to the likable relationship between Ellis and Neckbone to, particularly, McConaughey's performance. (Witherspoon is as bad as I've ever seen her, though. She keeps trying to find a character to play, but can't.) But it's pretty all over the place and never quite figures out what it's actually about. I think Nichols is someday going to make a great movie. I just bet it happens when he stops trying so damned hard to. Grierson & Leitch write regularly for Deadspin about movies. Follow them @griersonleitch.